Sellers returned today as bulls and bears tussle for control. With the constant back-and-forth, the short-term moves become more difficult to define, making it necessary to take a step back and look at the big picture. The Semiconductor Index is at one such juncture. 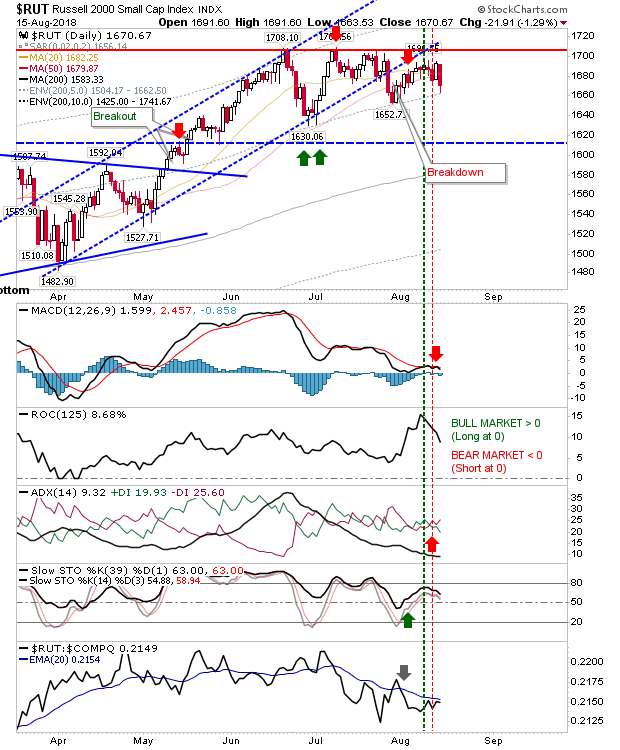 The index finished the day at rising support defined by the April and July swing lows. Wednesday's spike low illustrates underlying demand - offering a buying opportunity; stops on a loss of 1,321. The initial target is 1,420 but a larger breakout could deliver a lot more. 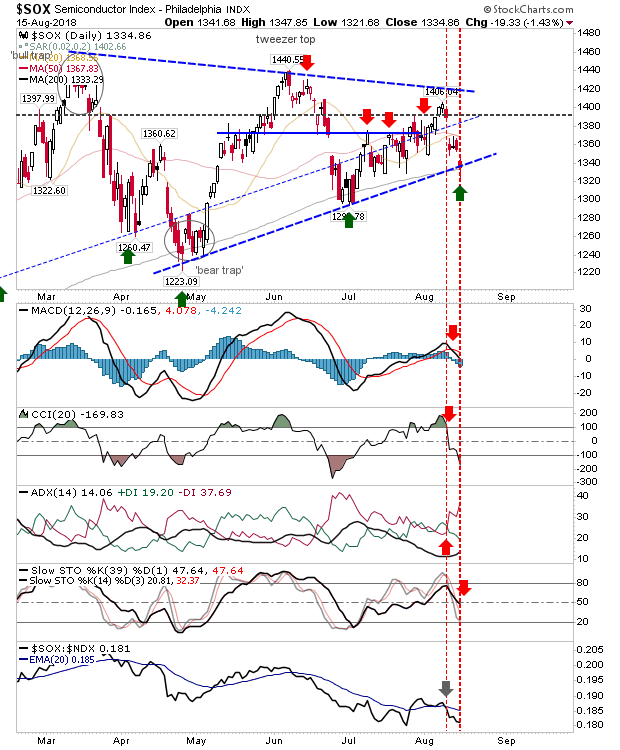 The only negative on the day was the net bearish turn in technicals as intermediate-term stochastics [39,1] crossed below the mid-line into bearish territory. However, a rally to triangle resistance would likely reverse this. The Russell 2000 is experiencing a slow (bearish) turnover. 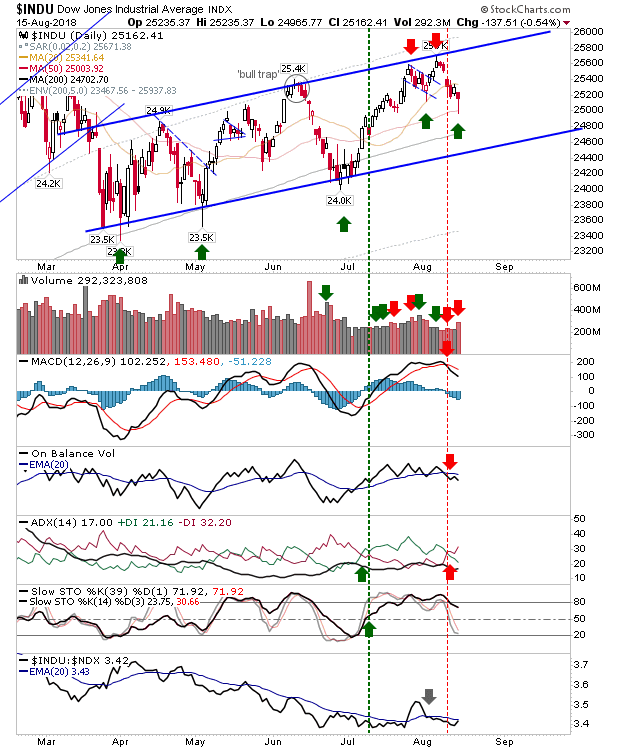 After a series of narrow range days, the market has opened up with wide-range days. Optimists might still see this as holding 50-day MA support but with relative performance struggling against its peers, this is looking like it might devolve into a larger sideways pattern. If losses continue, look to the June swing low at 1,630 as a possible rallying point. Large Caps may have started weak but there were bullish 'hammers' for the Dow Jones and S&P; the former tagging its 50-day MA. The selling in the Nasdaq undercut 7,800 support but has the rising price channel to lean on. 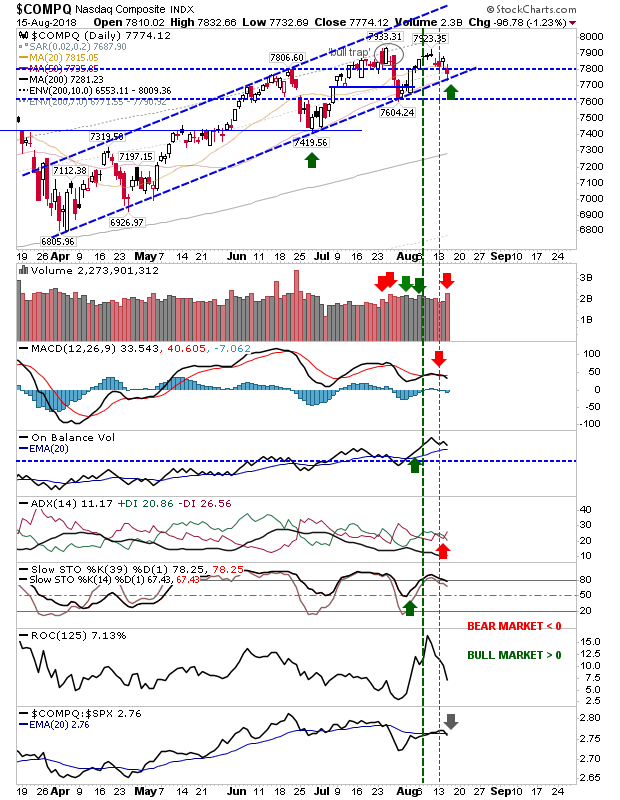 However, there was significant distribution associated with today's action and if there is more selling to follow today then there could be a channel break of the rising channel started in April by end of the week. For tomorrow, watch how the support tests in the Semiconductor Index, Dow Jones and Nasdaq play out. Given the constant back-and-forth don't be surprised if markets rally only to fall back on Friday. Day traders may have the most joy. Long-term investors have little reason to get aggressive here.